Life isn’t necessarily easy at Red Plant Vegetables. 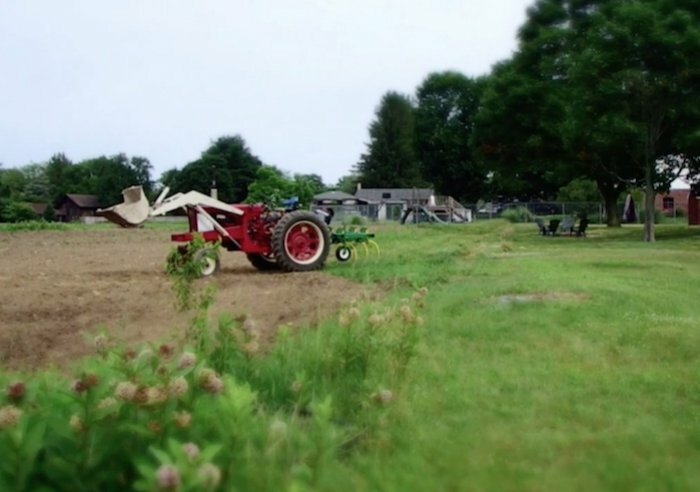 The farming operation in Johnston, Rhode Island, was established and operated by Catherine Mardosa and Matt Tracy, who grow chemical-free vegetables for a growing and dedicated food community looking for locally-sourced produce. But as Providence-based filmmaker and photographer David Wells shows in his short documentary Farm Time (A Year on the Farm with Red Planet Vegetables), the work is rewarding beyond measure. Created over the course of six shoots across four seasons and finished in March 2016, the video was shot initially for Edible Rhody magazine but later expanded and was chosen as an Official Selection for the 2017 NHdocs festival. It follows Mardosa and Tracy as they face the challenges of artisanal farming and reaps the rewards, which come in the form of personal satisfaction with their lives. The video features interviews as well as time-lapse sequences establishing the passing of time. “Like most projects these days it was a still and video shoot. While some people have issues shooting in both media, I don't, as long as I have plenty of time,” says Wells, who has also created video projects about a local granola maker who employs refugees from other countries, featured previously at Motion Arts Pro, and another project on quahogging on Narragansett Bay. Below we feature a trailer for Farm Time, along with Well’s account of making the doc. The video started as an assignment for one of my favorite clients, Edible Rhody. My editor said she had a really "good one" for me. She suspected that it might end up being a bigger project than the short three- to five-minute video that she normally wants from me. One of the many great things about this client is that since they only publish quarterly, most assignments are done with a one-year lead time. I did a total of six shoots — two in June and July of 2015, then two in October and December of 2015, then the one "snow" shoot in January of 2016, followed by one interview shoot in March of 2016. During the first and last shoot (especially the interviews) I worked closely with Mae Gammino, who is my partner in the video production company we run, www.broadrockfilms.com. Most of the shoots were on the farm in Johnston, Rhode Island, which is a 15-minutes drive west of Providence. We also did a shoot at a farmer's market in Providence. Like most projects these days it was a still and video shoot. While some people have issues shooting in both media, I don't, as long as I have plenty of time. The time lapse sequences featured in the opening and closing sections were made over the four seasons, with the camera on a tripod in roughly the same spot. I used an Olympus Tough camera atop a D.I.Y. 360-degree camera rotator (an IKEA egg timer with a tripod screw on top and a quick release plate on the bottom, both epoxied in place). I used a tree stump as a landmark so I could align the tripod in the same position during each of the shoots during the four seasons. Finding the stump in the snow was not easy. I used Olympus Micro Four Thirds cameras — mostly the OM-D E-M5 II— for the rest of the project. That camera has an audio in plug and an optional add on handgrip with an audio out plug so I can listen in on the audio to make sure I am getting the sound that I need. The sound was captured with Sennheiser microphones. I used a lav set for the interviews and a shotgun for the ambient sound. I edited the whole thing in Final Cut Pro X. All the skills that I have practiced doing photo-essays over the last 30-plus years came into play here. Working with people, developing trust, teasing out a story line, using my shooting time efficiently, composing beautiful frames, etc. This format, the ten- to 20-minute documentary short, plays to my strengths. It allows me to lay out an idea/story in a way not possible in the typical three- to five-minute short. I am looking forward to doing more of these for clients in the future. I am kind of surprised that I am learning to really love video as a format for visual storytelling. It incorporates visuals (of course) with the addition of sound and motion. When they figure out how to add smell and touch, it will be a complete sensory encompassing storytelling technology.